Merle Wood & Associates is pleased to announce that the I DYNASTY yacht sold this week. Featuring accommodations for 14 guests in 6 lavish staterooms, she has been maintained in meticulous condition. She features a stunning main deck master suite, an oversized VIP suite on the bridge deck, and 2 king and 2 queen staterooms on the lower deck. Each includes its own en suite, and the two forward staterooms are equipped with Pullman berths. An additional staff cabin is separated from the crew cabins, which accommodate 16 crew. 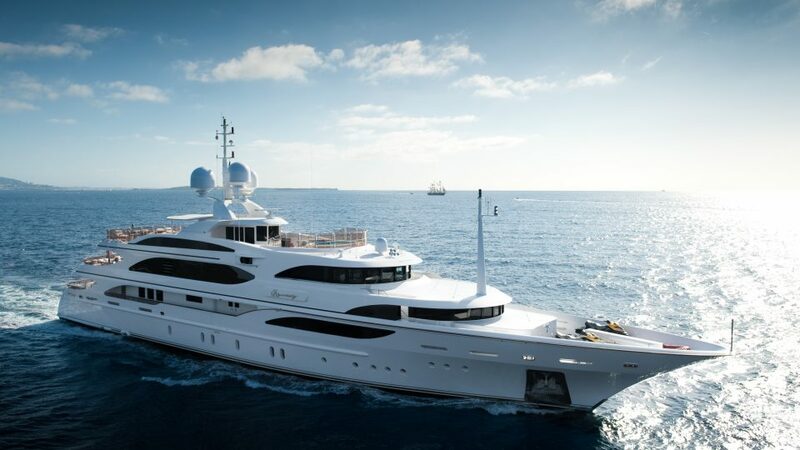 Having the I DYNASTY yacht sold represents yet another Benetti that Merle Wood & Associates has represented. No other brokerage firm has sold more Italian-built yachts than we have, whether representing the seller or buyer (including new yacht construction). With interior styling by the skilled hands of the yacht designers at Studio Massari, she reveals the best in comfortable furnishings that are neutral in tone, to please most tastes. She is enveloped in a mix of woods including mahogany, zebrawood, walnut, rosewood, and teak. A stunning elevator is enclosed in glass and ushers guests between all decks. The main salon flows into a formal dining area that features a pantry for easy crew service. Because she was built exclusively for her previous owner’s use, she has never been chartered. With naval architecture by Stefano Natuccci and built by Benetti in steel and aluminum, I DYNASTY received a complete paint job and extensive refit in 2015. Her sumptuous skylounge features a full bar, games table and theater with a raised seating area for optimal viewing. Her vast sun deck includes a grill, air-conditioned fitness area, a sauna, and a forward plunge pool that doubles as a Jacuzzi. Outdoor dining on the main deck aft is shaded, as is the more informal sun deck dining area. Powered by two MTU diesel engines, she offers a cruising speed of 15 knots and a top speed of 16 knots. I DYNASTY is MCA-compliant and equipped with zero-speed stabilizers for added onboard comfort. Many thanks to the corresponding brokers who assisted in the marketing of this vessel, and congratulations to luxury yacht broker Merle Wood for the sale. For more information on motor yachts for sale that are similar to I DYNASTY, please contact Merle Wood & Associates. For additional information, read the full I DYNASTY yacht specs or view the I DYNASTY yacht price and details. For information about the I DYNASTY yacht, or for expert knowledge from a qualified yacht charter broker, simply contact the luxury yacht brokerage firm of Merle Wood & Associates for assistance.